孙博超, 杨运楷, 王海亮, 宋晓玲, 黄倢. 零换水条件下益生菌组合在凡纳滨对虾育苗生产中的应用[J]. 上海海洋大学学报, 2019, 28(1): 93-102. SUN Bochao, YANG Yunkai, WANG Hailiang, SONG Xiaoling, HUANG Jie. Effects of probiotics combination on breeding of Litopenaeus vannamei under zero-water exchange condition[J]. Journal of Shanghai Ocean University, 2019, 28(1): 93-102. 叶乐, 杨莺莺, 吴开畅, 等. 益生菌在凡纳滨对虾育苗中的应用[J]. 南方水产, 2006, 2(4): 13-18. 宫春光, 于清海, 陈福杰. 南美白对虾育苗中弧菌病和丝状细菌病的防治对策[J]. 科学养鱼, 2008(9): 50-51. GONG C G, YU Q H, CHEN F J. Prevention and treatment of vibrio and filamentous bacterial disease in Litopenaeus vannamei[J]. Scientific Fish Farming, 2008(9): 50-51. 刘建勇. 复合微生物制剂在凡纳滨对虾育苗中的应用[J]. 海洋科学, 2005, 29(4): 36-40. 姚晓东. 抗生素在水产养殖中应用存在的问题及对策[J]. 农业与技术, 2016, 36(24): 103. YAO X D. The problems and countermeasures of antibiotics in aquaculture[J]. Agriculture & Technology, 2016, 36(24): 103. CHIU C H, CHENG C H, GUA W R, et al. 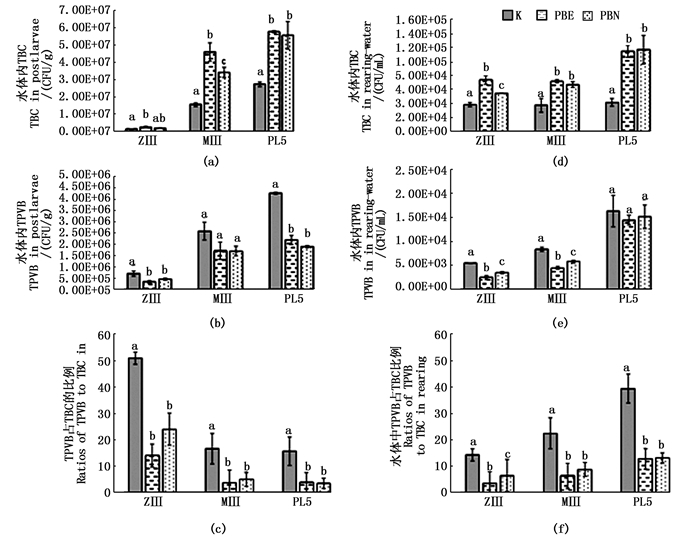 Dietary administration of the probiotic, Saccharomyces cerevisiae P13, enhanced the growth, innate immune responses, and disease resistance of the grouper, Epinephelus coioides[J]. Fish & Shellfish Immunology, 2010, 26(5): 691-698. LIU K F, CHIU C H, SHIU Y L, et al. Effects of the probiotic, Bacillus subtilis E20, on the survival, development, stress tolerance, and immune status of white shrimp, Litopenaeus vannamei larvae[J]. Fish & Shellfish Immunology, 2010, 28(5/6): 837-844. NIMRAT S, SUKSAWAT S, BOONTHAI T, et al. Potential Bacillus probiotics enhance bacterial numbers, water quality and growth during early development of white shrimp (Litopenaeus vannamei)[J]. Veterinary Microbiology, 2012, 159(3/4): 443-450. 吴翔宇, 于明超, 单洪伟, 等. 两株益生菌在凡纳滨对虾育苗生产中的应用[J]. 科学养鱼, 2014(2): 54-55. WU X Y, YU M C, SHAN H W, et al. The application of two probiotics in the production of prawn seedlings in Litopenaeus vannamei[J]. Scientific Fish Farming, 2014(2): 54-55. 王春迪, 宋晓玲, 张晓静, 等. 养殖水体中添加蜡样芽孢杆菌PC465对凡纳滨对虾抗病力的影响[J]. 中国水产科学, 2016, 23(1): 146-155. WANG C D, SONG X L, ZHANG X J, et al. Effects of adding Bacillus cereus PC465 to rearing water on disease resistance of Litopenaeus vannamei[J]. Journal of Fishery Sciences of China, 2016, 23(1): 146-155. 张盛静, 宋晓玲, 赵小金, 等. 饲料中添加益生菌对凡纳滨对虾抗感染和5种免疫基因表达的影响[J]. 水产学报, 2015, 39(6): 899-907. ZHANG S J, SONG X L, ZHAO X J, et al. Effects of adding probiotics to the feed on anti-infection and five kinds of immune gene expression of Litopenaeus vannamei[J]. Journal of Fisheries of China, 2015, 39(6): 899-907. 隋昶生, 王利华. 崂山奶山羊瘤胃微生物总DNA提取方法的优化[J]. 中国农学通报, 2009, 25(5): 18-21. SUI C S, WANG L H. Extraction method optimizing of total DNA in rumen microorganism of Laoshan dairy[J]. Chinese Agricultural Science Bulletin, 2009, 25(5): 18-21. 徐纪萍, 谈小兰, 钱辉仁. 凡纳滨对虾高密度零换水高产养殖技术[J]. 水产科技情报, 2012, 39(1): 26-29. 潘康成, 杨金龙, 王振华, 等. 枯草芽孢杆菌制剂在南美白对虾育苗上的应用[J]. 饲料研究, 2004(12): 33-34. 于鹏, 王腾, 于明超, 等. 三株潜在益生菌在凡纳滨对虾苗种培育过程中的应用[J]. 河北渔业, 2018(1): 12-16, 45. 周丽, 宫庆礼. 海水鱼虾蟹贝病害防治技术[M]. 青岛: 青岛海洋大学出版社, 1998: 83-86. ZHOU L, GONG Q L. Prevention and treatment of Marine fish, shrimp, crab and shellfish[M]. Qingdao: Qingdao Ocean University Press, 1998: 83-86. ZOKAEIFAR H, BABAEI N, SAAD C R, et al. Administration of Bacillus subtilis strains in the rearing water enhances the water quality, growth performance, immune response, and resistance against Vibrio harveyi infection in juvenile white shrimp, Litopenaeus vannamei[J]. Fish & Shellfish Immunology, 2014, 36(1): 68-74. 胡毅, 谭北平, 麦康森, 等. 饲料中益生菌对凡纳滨对虾生长、肠道菌群及部分免疫指标的影响[J]. 中国水产科学, 2008, 15(2): 244-251. 张艳艳, 刘小林, 黄海洪, 等. 凡纳滨对虾Crustin-like基因的克隆及在副溶血弧菌感染条件下的表达分析[J]. 西北农林科技大学学报(自然科学版), 2012, 40(12): 41-48. ZHANG Y Y, LIU X L, HUANG H H, et al. Molecular cloning of Crustin-like gene in the white shrimp (Litopenaeus vannamei) and its mRNA expression with Vibrio parahaemolyticus challenge[J]. Journal of Northwest A & F University (Natural Science Edition), 2012, 40(12): 41-48. BOOPATHY R, KERN C, CORBIN A. Use of Bacillus consortium in waste digestion and pathogen control in shrimp aquaculture[J]. International Biodeterioration & Biodegradation, 2015, 102: 159-164. 杨坤杰, 王欣, 熊金波, 等. 健康和患病凡纳滨对虾幼虾消化道菌群结构的比较[J]. 水产学报, 2016, 40(11): 1765-1773. YANG K J, WANG X, XIONG J B, et al. Comparison of the bacterial community structures between healthy and diseased juvenile shrimp (Litopenaeus vannamei) digestive tract[J]. Journal of Fisheries of China, 2016, 40(11): 1765-1773. 郁维娜, 戴文芳, 陶震, 等. 健康与患病凡纳滨对虾肠道菌群结构及功能差异研究[J]. 水产学报, 2018, 42(3): 399-409. YU W N, DAI W F, TAO Z, et al. Characterizing the compositional and functional structures of intestinal microflora between healthy and diseased Litopenaeus vannamei[J]. Journal of Fisheries of China, 2018, 42(3): 399-409. 李卓佳, 林亮, 杨莺莺, 等. 芽孢杆菌制剂对虾池环境微生物群落的影响[J]. 农业环境科学学报, 2007, 26(3): 1183-1189. 林亮, 李卓佳, 郭志勋, 等. 施用芽孢杆菌对虾池底泥细菌群落的影响[J]. 生态学杂志, 2005, 24(1): 26-29. Abstract: In order to explore breeding technology with the application of probiotics combinations for Penaeus vannamei under zero-water exchange conditions, four probiotic bacteria with different ecological functions were formulated to two combinations (i.e., PBE and PEN), which were applied in the breeding experiment from nauplius larval phase V (N5) to postlarvae phase V (PL5). Each experimental group contained six parallels and the control group was set at the same time. Culturing water was not exchanged throughout the experiment, and probiotics combinations were continuously applied to the water in the PBE and PBN groups. 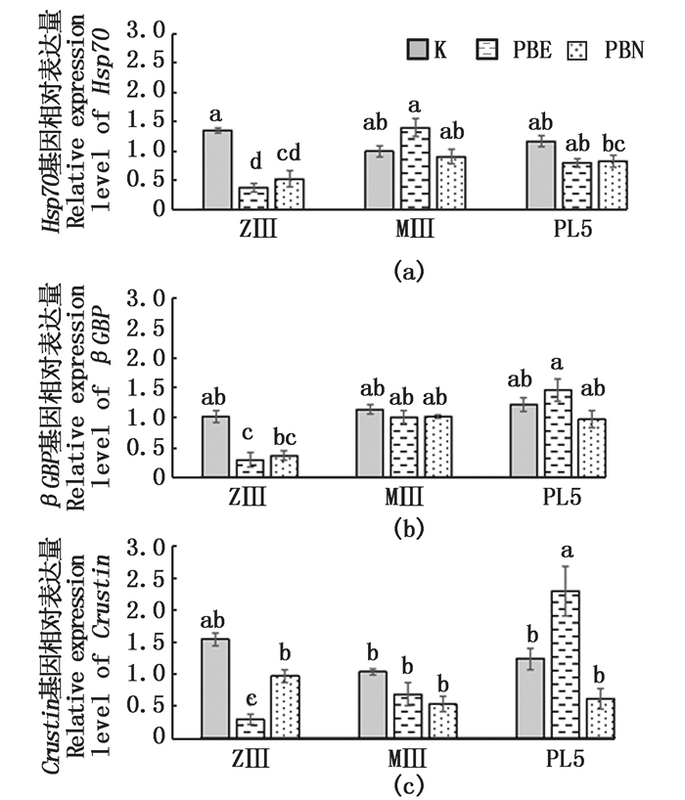 The larval metamorphosis rate, total culturable bacterial count (TBC) and total presumptive Vibrio bacteria (TPVB) in larva and water were counted at the phases of zoea Ⅲ (ZⅢ), mysis Ⅲ (MⅢ) and PL5. At the end of the experiment, the survival rate of postlarvae in each experimental group was determined, and the microbial communities from postlarvae were sequenced using an Illumina platform. 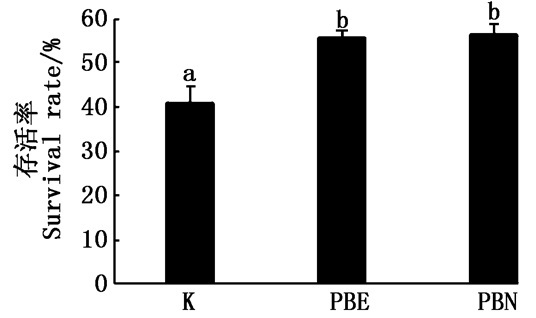 The results showed that there was no disease outbreak in each group, and that probiotics combinations significantly decreased (P < 0.05) relative abundances of TPVB in postlarvae and culturing water in the groups of PBE and PBN compared to that in the control group, and significantly increased (P < 0.05) the larval metamorphosis rate (15%) and survival rate (15%) at the phases of ZⅢ and PL5, respectively. 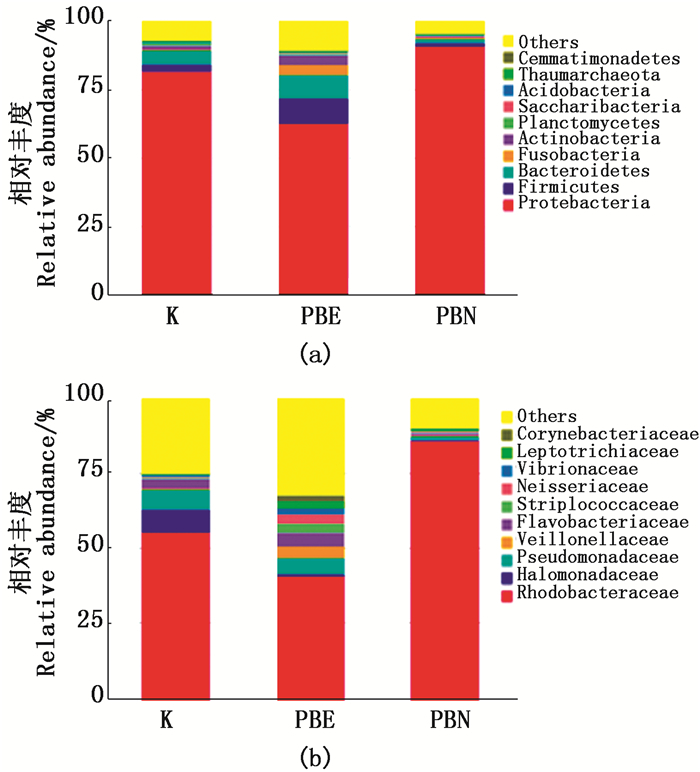 There was no striking difference of microbial diversities and structures of the core populations in the microbial communities from postlarvae in the three groups, and every microbial community was dominated by Rhodobacteriaceae with the relative abundance ranging from 40% to 86%. Taking together, probiotics combinations can effectively inhibit the overabundance of Vibrio in rearing-water and postlarvae and improve the survival rate of postlarvae, thereby achieving healthy breeding of P. vannamei under zero-water exchange conditions.